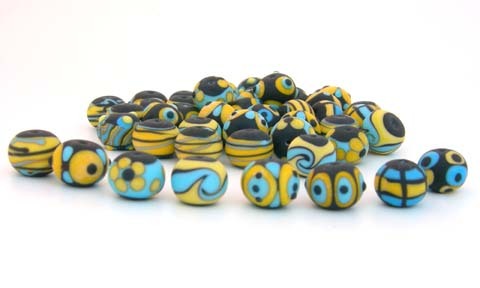 These are my favorite lampwork beads to create! 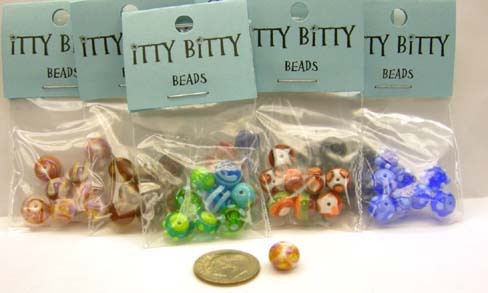 Bitty's average 3/8" +/- through the center and have a 1/32" hole, perfect for up to 18 ga wire or .024 bead wire. 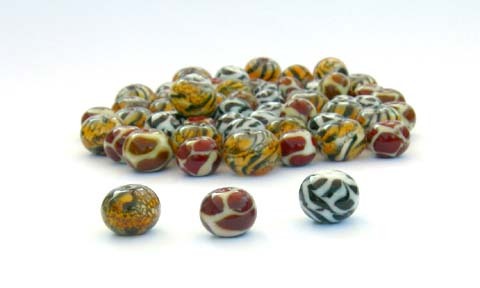 Because of their size they are fantastic for earrings and bracelets or companions to a focal bead in a necklace. 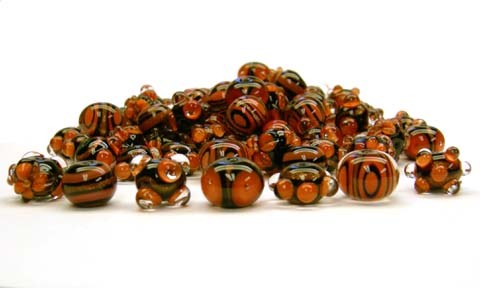 All my beads are kiln annealed and free of bead release. What you see in the photo is a representation of what is now a standard OR you can choose "Surprise Me" and I will choose something for you. 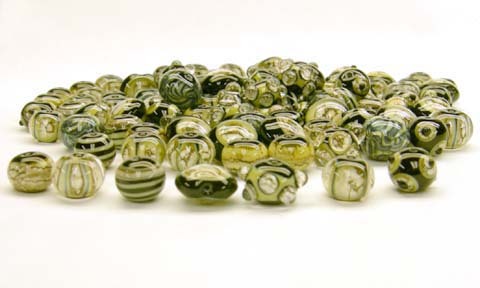 All orders placed through this website are made to order for you. Please allow up to one week for shipment. 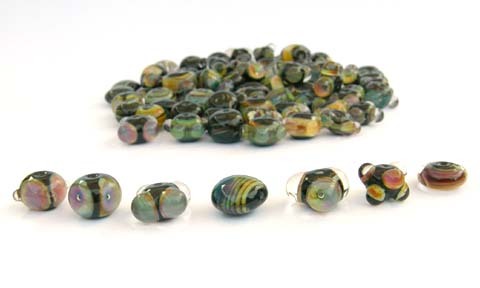 A black base bead with pale green and silvered ivory stringer detail. 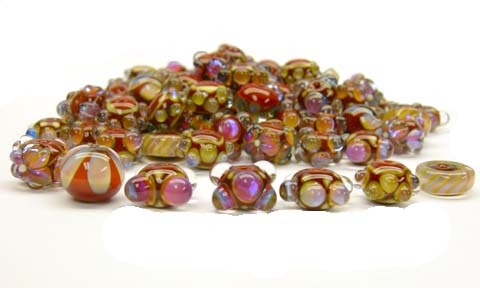 The stringer gives the beads an organic look. 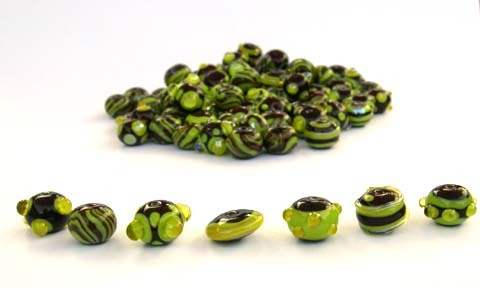 - Please Select - Center Band Stretched Dots Spiral Lentil Raised 4 x 4 Dots Poked Dot Raised 3 x 3 Triple Dot Surprise Me! Please Select Raised 3 x 3 Dot Twisty Stripe Raised Center 4 Dot Bitty Disk Raised Double Dots Raised Spiral Raised Center Dots Surprise Me! 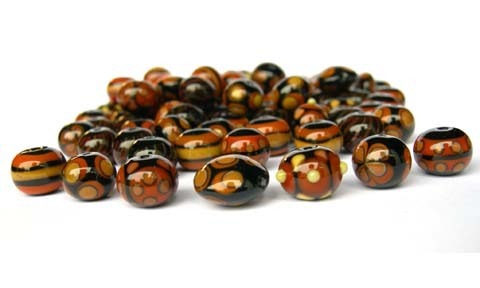 - Please Select - Raised 4 x4 Double Dot Wave Twisty Leaf Pattern Flat 4 x 4 Double Dot Twisty Bitty Disk Surprise Me! 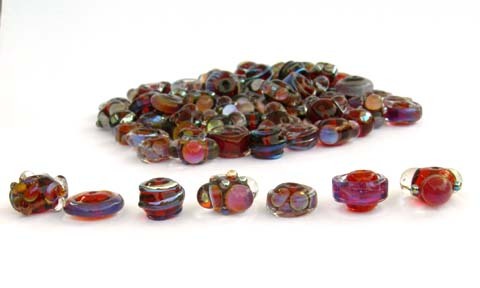 - Please Select - 3 Petal Flower Disk Raised Spiral Crown Dot Crunch Disk Padded Disk Raised 3 Dot Surprise Me! 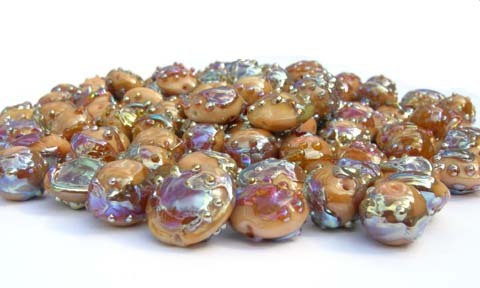 - Please Select - 4 Flat 4 Raised Dot Bubble Dot Raised 4 Dot Striped Lentil Triangle Bubble Dot 3 x 3 Raised Dot Bitty Disk Surprise Me! 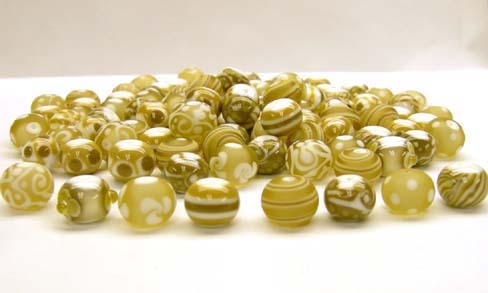 - Please Select - Raised 6 Middle Dot Flat 12 Dot Raised 8 Dot Flat Spiral Flat Swirl Raised 6 Dot w/Stripes Surprise Me! Please Select 4 Flat 4 Raised Dot Raised 3 x 3 Dot Crunch Disk Crown Dot Raised Middle Dot Raised 4 x 4 Dot Surprise Me! 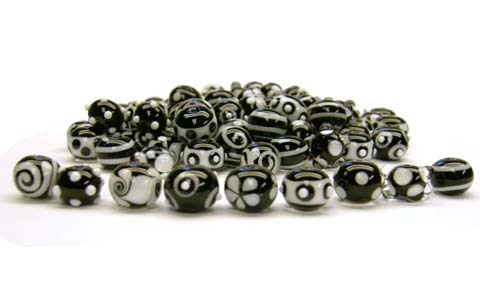 - Please Select - Crown Dot Raised 6 Dot Twisted Dots Spiral Middle 8 Double Dot Surprise Me! 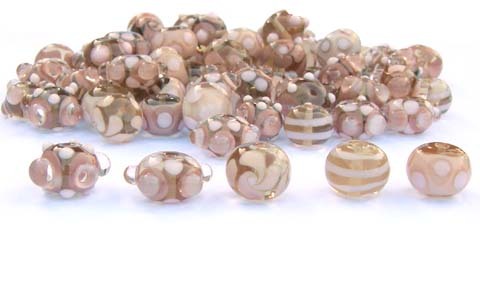 Taupe base bead with shimmery silver and pink gold accents. 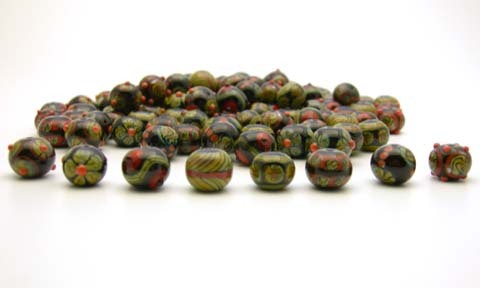 These beads have a free-form pattern. 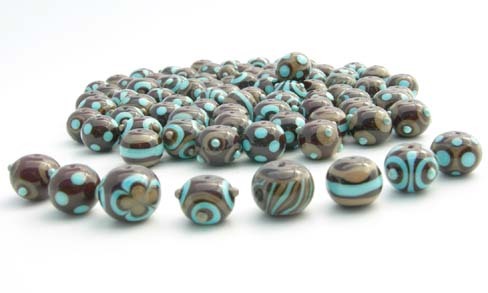 These beads are the colors of milk and coffee, half of the patterns are etched, the others are shiny. I've fallen in love with the richness of this family! 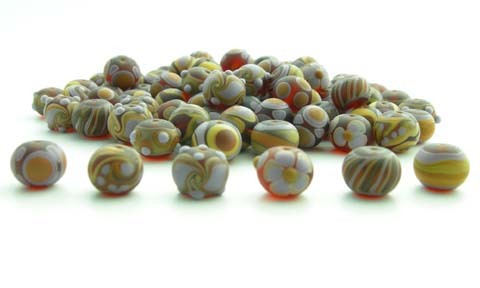 - Please Select - Etched Scroll 3 Flower Etched Twisted Dots 3 Stripes Etched Spiral Freeform Etched 12 Dot Latticino Surprise Me! 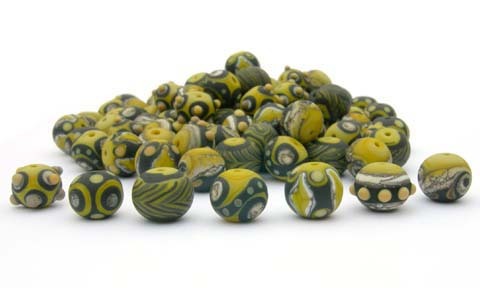 These beads are etched to a matte finish giving them depth. A touch of ivory stringer adds to the organic feel. 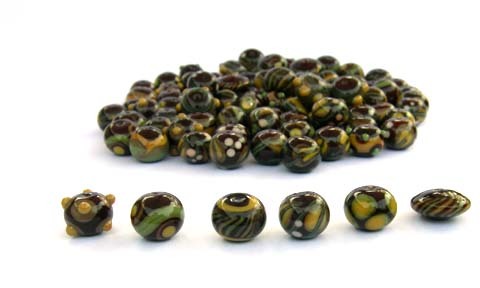 Black base bead with rich light brown and warm yellow patterns. 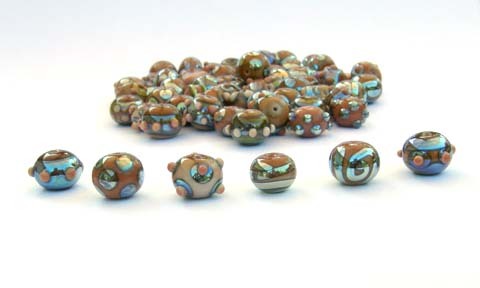 Light brown base bead with color shifting raku stringer accents. 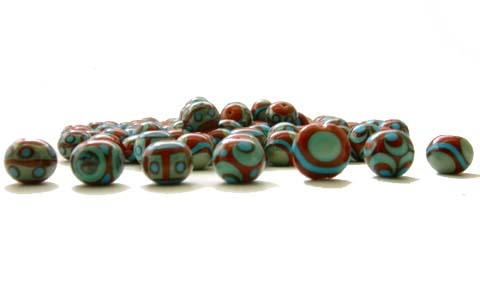 Rich brown red base bead with blue silvered patterns reminiscent of bali silver beads. 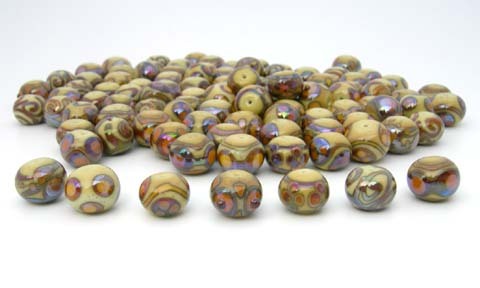 Light brown base bead with reflecting pastel pinks, purples, peach,or amber silvering glass. 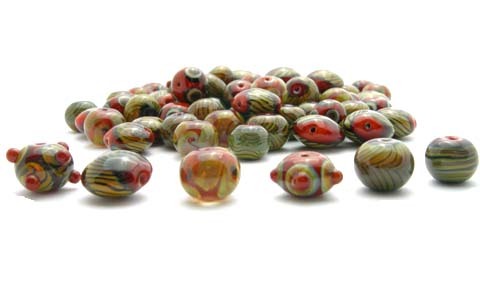 Each one is a little different. 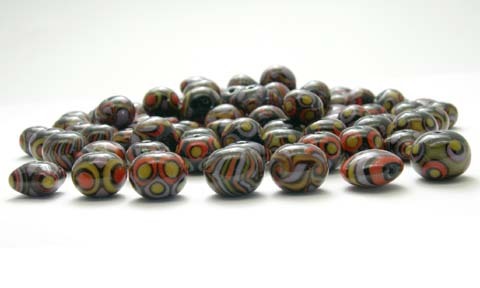 Dark red brown base bead with striated raku and coral patterns. 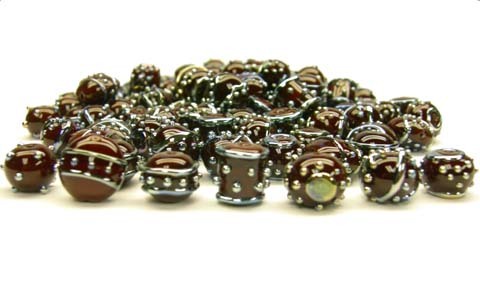 Black base bead with encased goldstone patterns. 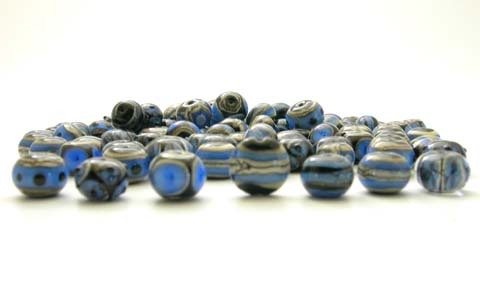 Black base bead with silvered ivory and transparent blue patterns. 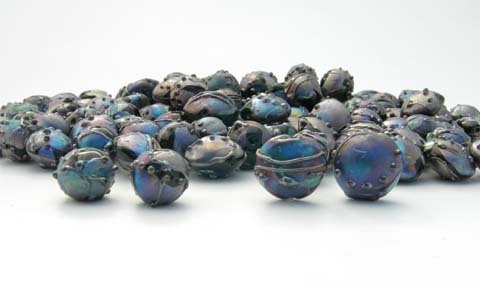 Black base bead with applied "oil slick" shards of purple, blue and/or teal. 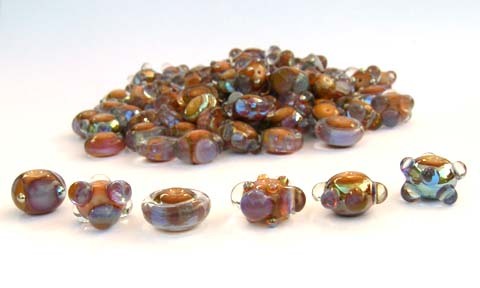 Every bead is unique due to the melting of the shards. 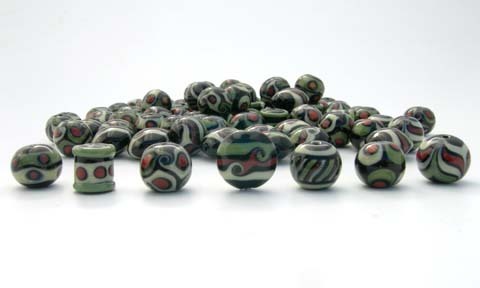 Black base bead with two shades of olive and a red brown accent in all the patterns. 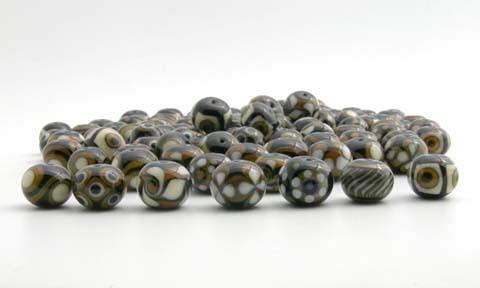 Black base bead with golden brown and ivory patterns. 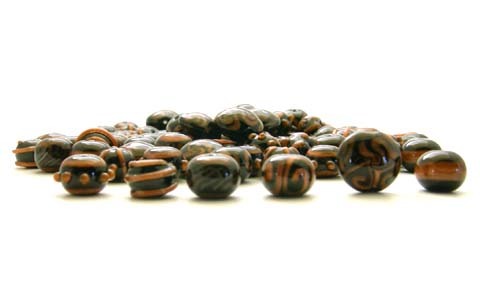 Medium brown base bead with green and turquoise patterns.